In taking this approach Odyssey showed that even before his famed “reforms,” Gluck was a composer with interesting, sometimes daring ideas. A performance like this one can, by the final chorus, effect dramatic and musical catharsis. The poet Pietro Metastasio, who wrote the text, was somewhat surprised upon meeting the young Gluck: “Surprising fire … but mad.” This Odyssey Opera performance gives us a chance to hear the reform of opera already on the way—almost act by act! Christoph Willibald Gluck (1714-1787) is known for one thing in the history of music: he “reformed” opera in a series of works composed in Vienna and Paris (in Italian and French respectively) in the last quarter-century of his life. But before starting on his path as a self-proclaimed reformer with Orfeo ed Euridice in 1762, he had composed 29 other operas, including an early version of Ezio (his 14th, produced in Prague in 1750). These have been overlooked by all but specialists, lumped into the vast mass of “old-fashioned,” “monotonous,” “stodgy” works in the genre of opera seria, which had become highly conventional in the last decades of the 17th century and the first half of the 18th. Throughout a good part of the 20th century, considerations of Baroque opera, and the opera seria conventions in particular, were usually discussed as if creators and audiences alike simply did not understand theatrical effect. Only after a number of these operas got produced, both in determinedly “period” productions such as those offered by BEMF, and in explicitly modernized productions such as Peter Sellars’s mounting of Handel’s Orlando at the American Repertory Theater in the early ’80s, was it possible to feel the emotional content of such formalized stage works. In this Ezio, through both the musical work of the singers and conductor Gil Rose and the effective simple gestures worked out with stage director Joshua Major, I was aware, time and again, of the way that the ABA structure of the frequent da capo arias could be made to further what the singer is expressing—through the ornamentation of the repeated A section—rather than simply leaving the audience at the emotional starting point. A different example: When Massimo (tenor William Hite) tries to urge Valentiniano to act quickly in dealing with his enemies, whom Massimo presents falsely as Ezio (in further pursuit of his murderous goal), he sings a rather surprising aria that starts as a lovely bit of pastoralism with an elaborate obbligato oboe part over gently scurrying strings. This is Gluck’s musical depiction of the text’s description of a rustling brook. Massimo’s point is that a gentle rill will not accomplish anything, whereas (in the B section) stormy music accompanies his description of a powerful flood that can accomplish much. Here the return to A has lolling, gentle, elegant decoration of the original form, which can be understood as Massimo essentially trying to hypnotize Valentiniano to his point of view. Throughout the opera, the singers regularly find ways, through vocal expression and restrained physical gesture, to extend the dramatic significance of that musical repetition, thus lending it a point that surpasses mere vocal athletics. Gil Rose assembled an impressive cast to meet the challenging demands of opera seria. In 1750, two of the roles were sung by castrati, the vocal power of the fully grown male body with the voicebox of a prepubescent boy being somehow keenly attractive to audiences for a couple of centuries. Today the problem arises of how to generate that unique sound. For some roles, a countertenor with a good high extension is the choice. The number of trained countertenors available has grown considerably ever since Alfred Deller revived that “singularity of voice” in the middle of the last century. Another choice—used in some early revivals of Baroque opera, was to give such roles (Handel’s Julius Caesar is one) to a bass, singing an octave lower than the register the part was originally written in. But this falsifies the musical interaction that frequently occurs in the Baroque era between the vocal line and an instrumental obbligato intertwining in the same register. The more common solution is to have a mezzo take the role, because her voice functions in the level intended by the composer—though with a telling difference: a castrato would be singing high in his range, producing a brilliance of sound that simply cannot happen with a mezzo singing in the lower half of her range, no matter how expert. Still, these solutions offer us the opportunity to hear operas that would be lost to us otherwise. For Ezio the first and last solutions to the “castrato problem” have been adopted. Countertenor Randall Scotting sang the role of Emperor Vitelliano. He is, by some inches, the tallest member of the cast, which allows him to tower over the others when acting imperially, though, as a figure who has several character weaknesses, his height also allows him to stoop slightly when dealing with underlings, thus physically suggesting his moral uncertainty even as he attempts to command. His clear countertenor helped to distinguish him easily in sheer sonority, as part of the dramatic situation. Ezio himself, the successful general, the faithful associate of a monarch who believes him capable of treachery, is a castrato role, here assigned to mezzo Brenda Patterson. In some ways this is the most thankless part. Ezio may be the title character, but he is mostly talked about and maneuvered around, as far as the drama is concerned, and the vocal line, even sung by as fine a mezzo as she, surmounts the orchestra and stage acoustics with difficulty. That said, she carried off the cross-dressing masculine assertiveness effectively. I’d love to hear her some day in another pants part, Octavian in Rosenkavalier. The real heart of the plot in Ezio involves the vengeful Massimo and his daughter Fulvia, the plaything of Roman politics. William Hite was superb both acting and singing as Massimo. He had the clearest Italian diction of any in the company (the presence of supertitles makes that attainment less important for many in the audience, but it is still wonderful to be able to make out almost every word). Though his part often causes him to skulk around, he must be by turns the murderous adviser, the loving father who still wants to force his daughter into a marriage she does not want, and the plotter afraid of being found out. All of these aspects he projected with authority. If one counts the number and the elaborateness of the arias given to a singer as the basis for evaluating that character’s role in the opera, one might suggest that Gluck should have named the opera Fulvia. Jennifer Holloway carried off the varied (mostly unhappy) positions into which her father’s plotting forced her, and expressed her reactions with stunning singing of her arias and especially the elaborations in the A-section repeats, which in every case extended her character’s personality. The final two singers of the cast are also the youngest, and they both gave excellent accounts of themselves. Erica Petrocelli, as Onoria, the sister of the emperor, was almost as much a plaything of fate as Fulvia. And Jesse Darden, as Varo, the prefect of the imperial guard and true friend of Ezio, was stalwart. (He played a small role in last June’s Sir John in Love.) Both carried off their arias effectively. One of the surprises, an increasingly pointed drama, came as the performance moved into Act 2. The first act is largely a matter of establishing the relations among the characters, each aria adding another stone to the edifice. The second act began to move faster, in the dialogue of the recitative, where attempted solutions to the characters’ concerns approach and fail in intricate ways. Through much of the first half only two characters interact onstage at any one time (even when others may be present). But as the act unfolds, the dialogue gets more pointed, the arias gradually shorter, with the effect of bringing the complications to a head. The most surprising musical moment in this opera, if not in any opera seria that I have seen, comes at the end of Act II. The plot has reached a point of such complexity that three characters sing in a single number—the expected aria suddenly triples in emphasis as they try to work out the solution. Not only is this a surprise for the audience, it makes for a superb act ending by highlighting exactly the (many) problems that remain to be resolved. The final act brings about the solution, with everyone still alive (two of them might well have died), lovers united, and villains forgiven. Metastasio had to work out his plots in this way because at the end of the opera, everyone was supposed to appear onstage to sing the final chorus—although the cast consists of just six singers—and no one could be missing. To modern dramatic conceptions this may seem like a deus ex machina happy ending, but in the 18th century it reflects the hopeful outlook of the Enlightenment, the conviction that humans can resolve their problems without bloodshed if only they act on their basic humanity. And when, for the only time in the whole opera, all six members of the singing cast appear in harmony, the opera can and does have—as it did Friday night at the BU Theater—a welcome joyous close. 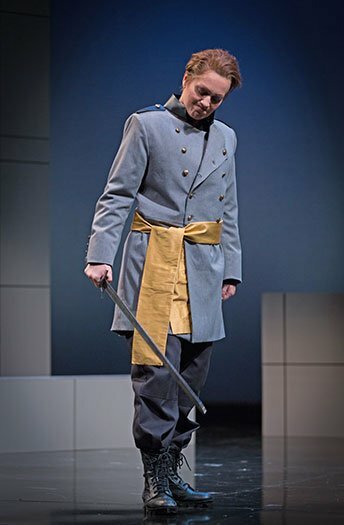 In addition to the repeat performance of Ezio on Sunday at 3p, the remainder of Odyssey Opera’s “When in Rome” festival consist of three performances of Mozart’s Lucio Silla at the BU Theater on Wednesday June 8 at 7:30pm, Friday June 10 at 7:30pm, and Sunday June 12 at 3pm. I was at Fridays performance and it was intense in emotional beauty and raw energy from remarkable singers with persuasive acting ability. The entire cast were able to weave together art, beauty, and eternal truth by sheer force of will. They were able to impact the audience that might be similar to ancient Greek theater by demanding our humanness by their performance. Make no mistake about it the opera in such hands can only change the audience with commanding power of song. Again I lucked out again to witness such human art. I agree with the above comment. Five sparkling stars for an utterly poignant, passionate, powerful performance! Both the singing and acting were absolutely riveting. As a result the characters were deeply affecting, not cardboard figures in a typically contrived operatic plot. Kudos to all, from Gil Rose and the orchestra to the singers and director for producing an emotionally cathartic and artistically superb musical gem. A moving and revelatory performance. Too bad the hall seemed only 1/3 filled. I had bought a side-section seat but was told upon entering that I was awarded an “upgrade”–in an attempt to fill the central orchestra section. Still, there were rows and rows of empty seats. Pity. The usual BEMF audience (where were they?) really missed out on this one. Very powerful performance–with a great review. I made a conscious decision to Support The Company so bought a full-price ticket in the balcony first row. Worrisome that the hall wasn’t filled–this is a great venue for opera that we will miss. Is the economy not doing that well that people are cutting back here as elsewhere? I hope we are not dealing with a dumbed-down market wherein the “M-word” has to be used to sell tickets, a perverse “WCRB-ification” of the Boston market. We hope that people aren’t losing interest. But those of us who went were treated to a gem very well done and presented, a life experience leaving us a well-rounded opera-goer now aware of what real opera seria can be like. Yes, opera seria has had a bad wrap, almost to the point we’re told something is wrong with us if we like it. OK, I like opera seria, and Ezio was practically pure classical unreformed opera seria. I was reminded of another classical opera seria I had seen last summer at Glimmerglass, Vivaldi’s Cato in Utica, in the way characters interacted dramatically with each other. So two notes about Opera Seria: (1) I have the thesis that the Opera Seria “movement” was sort of a “clean up opera” movement in the same way that the Hays Commission “cleaned up” Hollywood in the 1930’s. No more raunchy characters and situations in opera (comedy’s for that); instead much more high-minded subject matter seriously treated. (2) These works were often first written to be presented connected with court festivities; I am indebted to program notes from a Gluck Orfeo production done here in the 1990’s for the concept that these opera seria also had an overriding message to the Ruler (and by extension anyone in a position in authority) that there human conflicts/situations you will have to deal with, and there are things that you cannot expect other to do and that further you have no right to. The example in that case was the tacking on of a happy ending in Gluck’s Orfeo; in almost the same words this was the position of a Viennese reviewer of 1761. Yes, nowadays people sneer at the happy endings in most opera seria–until they encounter a tragic ending and then they complain, vide Haydn’s Orfeo a few years’ back in a concert performance here; While knowing that wrok throughly I didn’t go but friends went and were all bothered by its being true to the Orpheus legend’s actual grim ending. So, kudos to Odyssey for doing Ezio, and maybe I’ll see the “M-word” after all. On to Dvorak this fall!